The information we're about to share with you will likely make you pretty angry and it should. Do you consume any of these brands in the picture below (Silk, Starbucks, So Delicious, Horizon, Zico, Blue Diamond, Pacific, Carnation and Tempt)? My guess is that you probably do. The Cornucopia Institute released a Video by it’s co-founder and Senior Farm Analyst, Mark Kastel and a full PDF Report that shares some very startling practices between the USDA and the NOSA “National Organic Standards Board”- the agency that regulates organic food. This report explains the details behind several allegations of corporate corruption that has allowed several agribusinesses to use chemicals in organic products without sufficient regulatory oversight. One of the findings has to do with a carcinogenic ingredient all these products have in common, a substance derived from red algae called carrageenan. Carrageenan can be found in most milk substitute products, infant formula, deli meats, cottage cheese and some flavored coconut waters regardless if the product is certified organic by the USDA. I know so many people who get soy lattes from Starbucks to avoid having to consume conventional milk products, so I thought it would be pertinent to include them here on the list below, since they and many other coffee shops use soy milk that contains carrageenan. I’ve had my doubts about carrageenan for a long time – it started last year when my cousin from Ohio sent me a Facebook message asking about whether or not it was ok to feed store bought almond milk that contained this additive to her toddler aged son. Since I didn’t have all the facts, I erred on the side of caution and suggested she make her own almond milk from scratch only. Now, there are sound reasons and a plethora of studies that the Cornucopia Institute has summarized that has made all my hunches come true. Their report detailed out several specific studies that showed that food safe and approved “undergraded” carrageenan is containaminated with the non-approved degraded carrageenan. Furthermore, when you ingest the undergraded version, it actually starts to degrade in the gastrointestinal tract and in the liver and turn into a carcinogen, resulting in a serious inflammatory agent that also can cause intestinal abnormalities. Because of this reason and other studies conducted the World Health Organization’s International Agency for Research on Cancer and the National Research Council of the United States both have determined that carrageenan is a carcinogen – a substance that causes cancer. How In The World Can A Carcinogen Be Allowed Into Organic Food? This is where the Cornucopia Institute does a extraordinary job showing you the timeline of events, lack of regulation, and down right shadiness that all led up to carrageenan’s approval. They show you the series of situations where companies that profit from these ingredients were some of the only reviewers involved in the decision. It’s easy to understand how this can happen, now that organic food companies are being bought by major conventional food companies left and right. 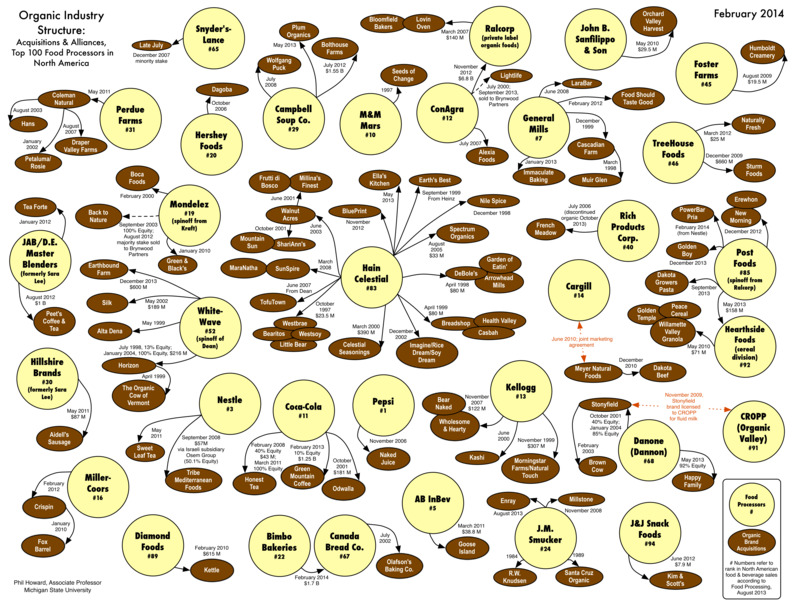 Below is a chart taken from the Cornucopia website that shows the relationship big food now has on several smaller organic companies. Every time I mention a particular ingredient and it’s harm, I come across opponents to my line of arguments, saying that I am being alarmist or using scare tactics. They love to point out that it’s “food grade” or is safe in “low doses.” Looking at the findings and report on carrageenan, you can see these arguments can be seriously flawed. It reminds me of the times where I discussed the ingredient proplyene glycol in Panera Bread’s salad dressings and TBHQ in Chick-fil-A’s sandwiches. Just like the NOSB has accomplished with the USDA, the FDA also has continuously approved countless chemicals to be added to our food in a low doses. Does anyone really know what the cumulative effect of these additives is over time? Our soil is already depleted of several vitamins and minerals and the nutrition content of our food is declining every single year. How can we afford to put these chemicals in our body? Should we let the FDA tell us what percentage is safe? Or should we use our common sense and decide as a collective group not to consume these additives and chemicals? I don’t know about you but I feel personally duped by carrageenan. 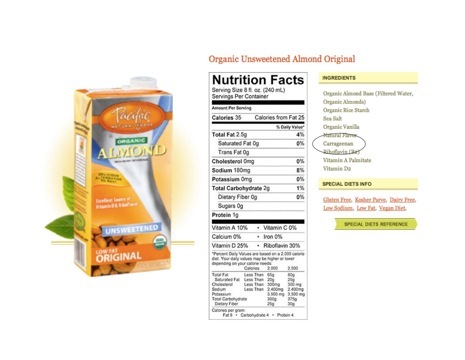 I assumed that once a product was certified organic like Pacific Almond Milk, that it was perfectly safe to drink. I’ve even recommended this product and some others that contained carrageenan here on this site. I’ve since cleaned up my ingredient lists on my recipes and made sure my pantry staples list does not contain any products with this additive in it. We are all learning here together and I hope you forgive me for ever assuming this substance was safe to consume, because it is clearly not. Milk substitutes are wildly popular and something many people consume almost everyday, so it’s important that if you were relying on one of these products above to start making your own milk or find another substitute. It’s so easy to make your own. Watch this video to see how I make it. I like to strain my milk through a very fine grain strainer. Check it out, just to see how easy it is! You won’t ever be tempted to buy processed almond milk in a carton again. Even though Cornucopia estimates they are close to 300 chemical additives approved to be used in organics, there are still thousands approved for conventional products. The facts presented here should not discourage you to eat less organic food, but to encourage you to fight for its regulations and ultimate safeguard. I urge you to watch the Video by Mark Kastel and read the Full Cornucopia Report when you have time and to spread this information to as many people as possible. 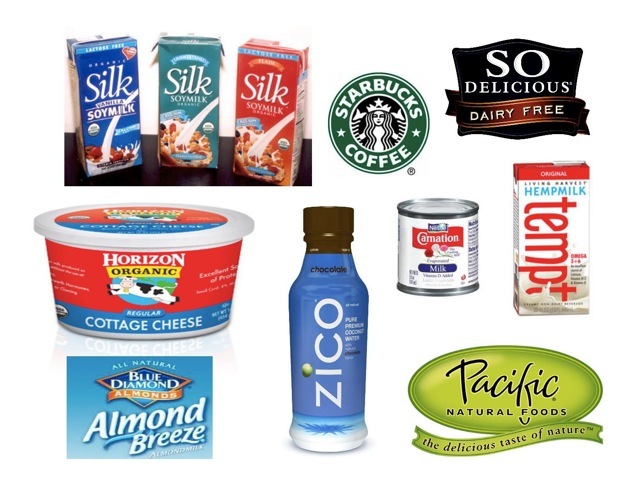 Update: Check out Cornucopia’s new shopping guide to find out which products do and do not contain carrageenan (Tree of Life, 365 Brand Whole Foods and Trader Joe’s (cold section) are a few).